The decisive criteria to receive a ghetto-pension are that claimants worked in the ghettos “of their own accord“ and were paid for it. Survivors need to prove that this was the case. To facilitate the investigation into the claims judges of the Higher Social Court from the county of North Rhine Westphalia started to stage hearings of survivors in Israel. In Germany, the court cases mostly take place without the survivors. On the morning of Bella Grünwald´s hearing, a thick haze seems to engulf all of Jerusalem. Even the massive, antique walls of the old city are difficult to spot from the spacious balcony of the King David Hotel. By its own account, history was and still is written in this long-established five-star hotel in the heart of the holy city. Internationally renowned celebrities from politics to popular culture have stayed at the hotel. This is illustrated in the design of the entrance hall: from the western to the eastern wing a white integrated stripe stretches across the brown and grey marble tiles – the marble is inscribed with the year and the signature of selected guests such as 1931 Hailie Selassie, 1969 Axel Springer, 1994 Bill Clinton and 2003 Richard Gere. The grand interior of the hotel with its white columns, and elaborate turquoise and ruby coloured stucco in the entrance hall are coupled with textile art of three-thousand years ago, reminding visitors of the glorious period of King David. Bella Grünwald is visiting the King David Hotel for the first time. The over-eighty-year-old seems a little lost within this grandeur. The orthodox Jewish woman wears a green-black chequered long skirt with a corresponding sack coat under which a lace collar protrudes. A velvet snood covers her hair. 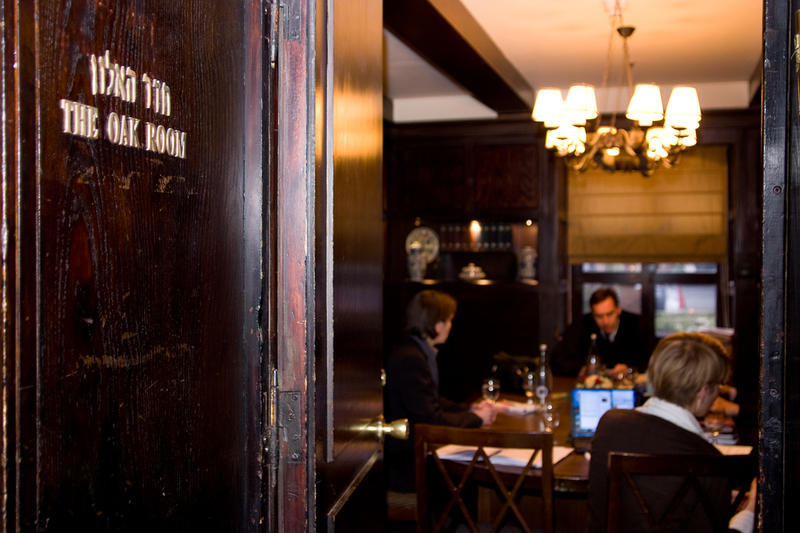 Jan Robert von Renesse, judge at the Higher Social Court in Essen, Germany, has invited her to the Oak Room of the hotel. 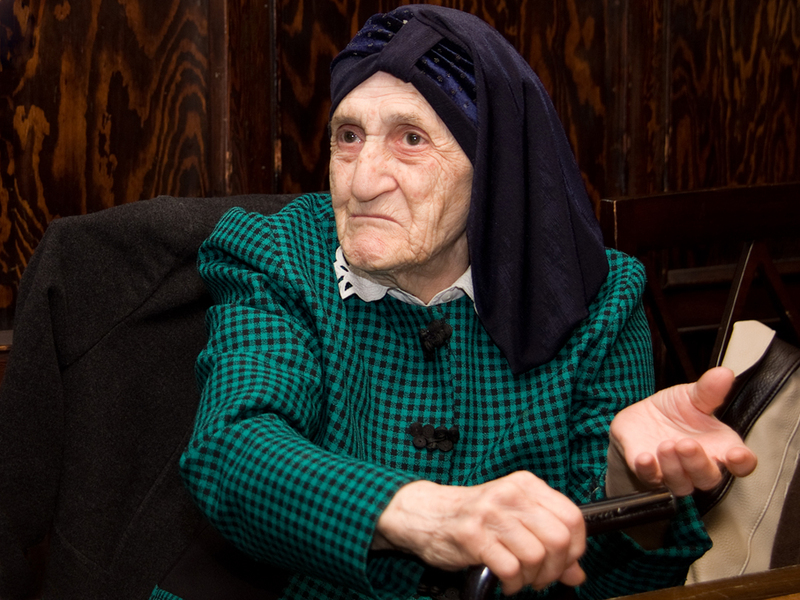 Bella Grünwald survived Auschwitz. Today, the dark-haired, determined judge wants to hear her case; was she in a ghetto in Hungary, whether she worked there “of her own accord“, how long she worked and whether her activities were paid. In the light of surviving a concentration camp or forced labour, this appears trivial. For a ghetto-pension, it is crucial. Judge von Renesse has thought about this. “It is troublesome for the claimant to come to Germany. For health reasons but also since too much there reminds them of the past. Therefore, the judge travels to where the people live,“ he explains. “It is after all the core of every court case to talk to the people who it is about. For me, there is no legally sustainable reason, why one should make an exception, especially with Jewish victims of persecution,“ he insists. Bella Grünwald is a small person. While she looks for the right room, she draws on a black, l-shaped walking stick. Her son accompanies her. She is one of 70.000 people who have filed a claim for a ghetto-pension. Her initial claim was denied, up until September 2007, 95% were rejected. In 2005, the Federal German government stated, the high rejection rate could solely be traced back to the claimants not understanding the proper application procedures and “their (claimants) ignorance with regards to the legal status that only initially seems complicated“. However in 2007, the Federal government, due to pressure from Israel, officially approved guidelines on how to certify the work in the ghettos. Initially, the law was supposed to allow for monthly pensions of between 50 and 400 Euros. To qualify for a pension people had to have been forced to stay in a ghetto, and work “of their own accord“ and “on a paid basis“. Contrary to forced labour where people were heavily guarded at all times and had no say in the work. The ghetto was supposed to be in an area, occupied or “incorporated“ by the German Reich. As such the lack of contribution to social insurances is now theoretically to be compensated to survivors. Even though many people worked in the ghettos they still failed to meet the strict pension requirements. Another judicial requirement makes life difficult for the claimants, as they need proof of their working conditions. Almost 65 years later, this demands a precise memory of the survivors. Due to their age, trauma and the time passed, they often cannot fulfil those demands. In addition to that, they find themselves in a challenging role of witness and claimant in one person. And for those persecuted by the German Nazi-regime, it also means a confrontation with having survived. So the story of their lives is evaluated solely in a legal framework. In the majority of cases, the approach of the responsible public authorities is far from respectful and put survivors into very distressing situations. In Germany, the hearings generally take place without the claimants. Today however, the claimant is present. Dark oak tones set the atmosphere in the Oak Room. Blue and white vases and bowls with arabesque flower patterns frame books, whose backs are decorated with Hebrew characters. Bella Grünwald is fine with the attendance of two press people. The representative of the pension-insurer Rhineland, who rejected 95% of the applications for a ghetto-pension from Israel, does not agree with the participation of the press at first. And then changes his mind. Other people present in the room are the son of Bella Grünwald and her lawyer, the translator, one historical expert for ghettos and one social-psychological expert. And then she starts to talk. How the mayor of the Hungarian town Tab chose young girls to work. How they were supposed to build a luxurious municipality. She remembers mining pits and a little pocket money. And she remembers her transport to Auschwitz. The judge then comes back to the ghetto. With her walking stick, she stomps on the floor. Her hands gesture vehemently. “I remember everything. I would like to remember things of today as well as I remember things from the past“. Then judge von Renesse comes in and inquires about guards and policemen. The representative of the pension insurers asks about the cooperation of the municipality with the police. Bella Grünwald answers: “There was no choosing in the ghetto. It was not a free place.“ Then the hearing moves into the discussion phase. The translation of this part is not envisaged for the claimant. Both experts issue their statements, which are in favour of the claimant´s application. But the representative of the pension insurer frowns, leans forward, sorts out his dark-blue tie with pink stripes behind the table and presses his fingertips against one another. “It is always the same. That is the problem,“ he says with his frown deepening. He only got an average impression of the whole story. And then there is mentioning of ‘forced work’ in the report. That would contradict the idea of “of one´s own accord“. Judge von Renesse is now talking in a determined way and mentions the clarifying verdicts. According to those, the term ‘force’ needs to be interpreted differently in the historical context. Both of them start to discuss. Finally the representative of the pension insurer agrees to a ghetto-pension. Based on the one month of Bella Grünwald ´s work in the ghetto in June 1944. In the past, rejections were issued at desks, the basis of their issue was opaque. And survivors still face a number of problems including proving payment for their work. Until the verdict of the Federal Social Court of June 2009, vouchers or goods did not count as payment. Another issue of debate was the voluntariness of the work. Being guarded on the way to work was interpreted as forced labour. In addition, the responsible bodies doubted that people registered voluntarily for work, since most of them were children. In some cases, historical sources were non-existent, which would have eased the burden of proof. Until recently, the persecution of Jews in Poland and other occupied areas, which took place under the national-socialist regime of violence, was hardly studied. That has subsequently changed, but even where historical sources were cited, the pension insurers hardly took notice. Historians criticised this practice as “ahistorical“ and “schematic“. In a political appeal, historians warned of a misguided stance, this appeal appears all the more urgent, since a lot of claimants are already very old or have died. The files of the Federal Compensation law also played an important role in the ghetto-pension cases. There, survivors did not mention their work in the ghettos but talked about the forceful character of their later work. This was played against them in their ghetto-pension cases. Work in the ghettos was simply interpreted as forced labour and rejected as a contribution period to their pensions. Bella Grünwald also saw herself confronted with those challenges. Noticeably exhausted, she agrees to the formalities and walks out of the room with small steps. Her son finalises something with the judge on the corridor. Fatigued, Bella Grünwald sinks into one of the velvet armchairs by the reading room. In the dimmed light, she almost seems to blur with the seat. 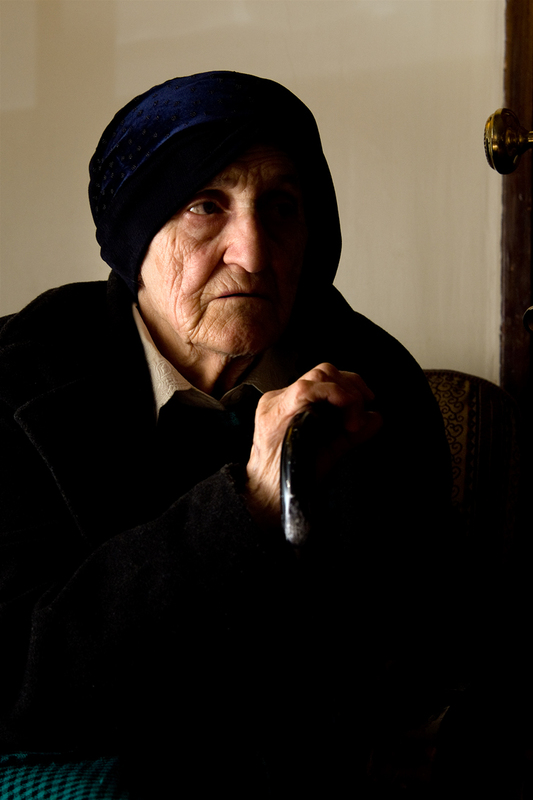 For the impoverished survivor, a pension of 150Euros per month makes a significant difference. Then she slowly leaves the hotel with her son and gets swallowed up by the evening fog. The high revolving door continues to spin in circles. Just as the disputes of many survivors for their ghetto-pensions.